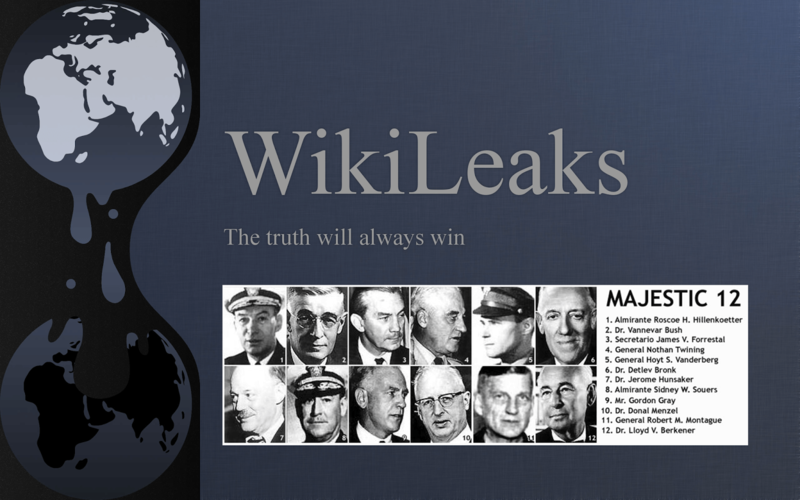 According to Wikileaks Stratfor UFO files, among all the controversial documents leaked to the public in the last twenty years regarding state secrets and the UFO phenomena is the fantastic revelations of the CIA’s unacknowledged MJ MAJESTIC TWELVE files disclosing the most guarded of all classified subjects-extraterrestrial life forms and their technologies. In order to secure this knowledge and prevent foreign countries from learning this vital secret and get an edge on the United States, President Harry S. Truman signed a finding that basically said that no one (including a chief executive) was to be in possession of, or disclose the finding without a “need to know” clearance which was above Top Secret. The directive was secretly implemented without the consent or knowledge of the Congress and concealed by the wording of the National Security Act of 1947 which prohibits disclosing classified matters without presidential approval and prior agreement by the Department of Defense and the Central Intelligence Agency as amended in later national security acts. Knowledge of the finding was limited to only a select few within the intelligence and scientific community of the government and as long as the secret remained unresolved, there would be no official acknowledgment. The only official study program Project BLUE BOOK was taken over by the CIA in 1953 as a public experiment and used as a debunking tool to discount the extraterrestrial reality and possibly to quash any attempts by the KGB and GRU to glean any technological or defense secrets from the study. Like the Manhattan Project, MJ MAJESTIC TWELVE or MJ-12 (as used in some leaked documents) was a joint government/military/private sector undertaking that encompassed every facet of national security functions and the CIA was the premiere intelligence agency tasked with the first line of defense of the United States during the 55-year Cold War between the Capitalist West and the Communist East worlds. When Angleton assumed his throne as Chief of Counterintelligence, no doubt that Truman’s directive was the most excellent and inviting instrument to carry on his mole hunt career within the CIA against the KGB and GRU. MJ MAJESTIC TWELVE enjoyed greater protection than that of the hydrogen bomb program of the early 1950’s and with that, the Soviets were driven to not only penetrate the secrets of the H-bomb program itself, but the ultimate prize that lay scattered throughout the maximum security research facilities of the U.S. Government located in the Southwest and Eastern United States. The shocking truth of the Soviet atomic weapons espionage program called ENORMOUS had dealt a tremendous blow to U.S. and British security when it was learned that British diplomats operating within the State Department and American Army technicians at Los Alamos National Laboratories had not only supplied blueprints and materials to their KGB handlers in New York for the atomic bomb, but stole the proposed plans for the hydrogen bomb as well and left security officials guessing what else did the Soviet spies steal from under their noses. As far as we know, there was no successful penetration by KGB or GRU agents into the CIA’s UFO program due in large part by the disgraceful and unlawful actions taken by Angleton’s CI Staff. After the fallout from the Burgess-MacLean-Phibly defections and the execution of the Rosenbergs, Angleton tightened the security and dedicated himself fully to the safeguarding of what secrets that still alluded the Soviets and embarked on a vicious mole hunt that would almost paralyze the CIA until his departure in 1974. During the Eisenhower Administration the CIA was at its apex in covert operations piling up one success after another where cores of Soviet moles were detected and sent home to Moscow. Comments from the White House were nil when it came to the UFO problem though the supposed meeting of extraterrestrials and Eisenhower in 1954 was given some publicity, it was largely discounted in the press though some had tried to connect Eisenhower’s heart attack with the meeting, national magazines and the media were downplaying the UFO sightings here and abroad as part of a cold war hysteria that accompanied the “duck and cover” scare that seemed to grip the nation. Soon after Kennedy became president, he began to needle the CIA for information on UFO’s which was unnerving at the outset to Allen Dulles after he was burned on the failed Bay of Pigs invasion of Castro’s communist enslaved island of Cuba in April 1961. According to the DCI Top Secret/MJ 12 document, it leaves no doubt that Dulles was not going to cooperate with Kennedy’s request and forwarded it to Angleton for consideration and feedback. MJ MAJESTIC TWELVE included spin-off projects that were obviously equally sensitive activities of the CIA such as PARASITE, PARHELION, ENVIRO, PSYOP, GREEN, SPIKE, and HOUSE CLEANING. Other sensitive and covert programs could be affected as well, such as MK ULTRA, ARTICHOKE and DOMESTIC which all appear to have been valid projects associated with MJ MAJESTIC TWELVE. The full implications of the above are not clear at present but it is obvious that the other projects were held in readiness for some kind of mass indoctrination and deception undertaking in a national crisis.